click hereThis group meets on the last Thursday of the month 7:00 PM at the Liverpool Senior Citizens Center. The public is invited. Contact Pat Campbell for info. Your Stories of Old Liverpool Fond memories of growing up in Liverpool. Or, stories your Grandma told you about life here in the Good Old Days. Submit these remembrances to the webmaster for sharing. Perry County (1820), originally part of Cumberland County, is located in the south central section of Pennsylvania and consists of 564 square miles. It is composed of twenty-one townships and nine boroughs, of which Liverpool is one. 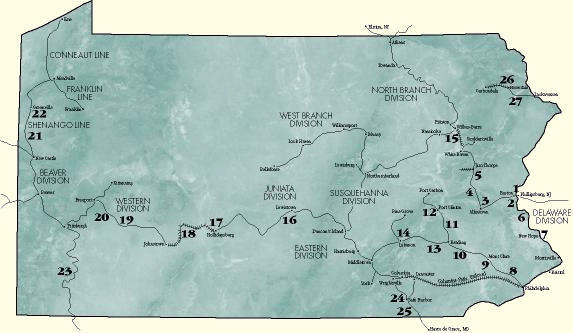 It is bordered on the east by the Susquehenna River, the north by the Tuscarora Mountain, the south by the Blue Mountain, these two mountain ranges merge on the western edge of the county. The Juniata River crosses the county also. A marvelous source of information is to be found in Hain's History of Perry County, in the various Centennial books published by a number of the Perry County communities and in the local libraries. From the Pennsylvania Visitors Network ..
Perry County, (population 41,000) originally part of Cumberland County, became the 51st county in Pennsylvania on March 22, 1820 and is named for Commodore Oliver Hazard Perry, the American hero of the naval engagement with the British on Lake Erie in the War of 1812. Part of the Appalachian Mountain Region, Perry County is bordered on the north, west and south by the Tuscarora, Conococheaque and Blue Mountains. On the east Perry County is bordered by 28 miles of the Susquehanna River. The county's forests and woodlands are recognized as exceptional hunting areas, especially for whitetail deer, turkey and squirrel. The steams, rivers and Lake Holman at Little Buffalo State Park provide excellent fishing sites for trout, bass and muskie. Hunters, fisherman and other visitors can stop at the mountain overlooks-scenic wonders of Perry County-or explore the many historical sites in the county. Fourteen covered bridges and seventeen old mills are scattered throughout the county, which is also dotted with antique and gift shops. Get away from the hustle and bustle. Come see the mountains in the spring when they come alive. Or the summer, when the fish are jumping. The foliage in the fall is simply outstanding and you haven't seen anything until you've seen Perry County blanketed by snow in the winter. Lore has it that a Susquehannock village in the Liverpool area and another near Mexico (PA) warred on occasion. A raid would occur by the most recent losers, raiding stores and capturing women. The losers would have to pay homage to the winners by sharing their bass catch. The tribe would trek across country from the Susquehanna to the Juniata with a load of fish for the other tribe. This path they followed was known as Bass Road. It exists today as the Pfoutz Valley Rd. The Susquehannock, the tribe that vanished. The plot on which Liverpool was originally laid out was warranted by John Staily. On October 25, 1808, he and his wife (Eve) gave deed to John Huggins for 121 acres, reserving therefrom one and a half acres for a graveyard. John Huggins had it surveyed and plotted by Peter Williamson. This old plot shows it as extendtng from Strawberry Street to North Alley. It was incorporated by an act of the legislature of May 4, 1832. 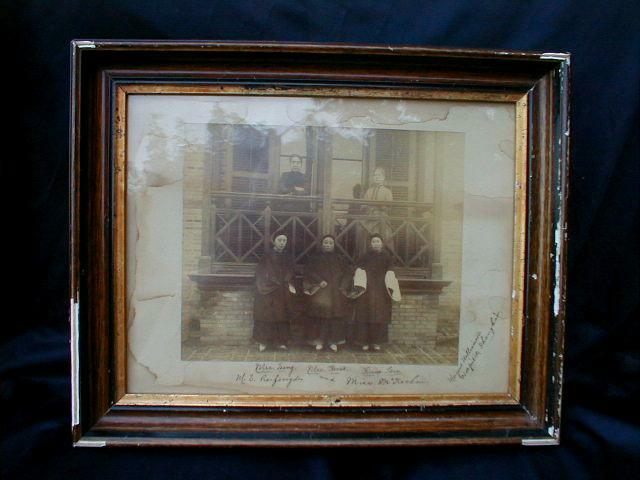 The Huggins and Staily families, who were relatives, were very numerous then. Local Lore ..displayed at the July 2000 meeting of the Liverpool Historians was a 1894 Liverpool Business Directory, courtesy of Marth Minihan. 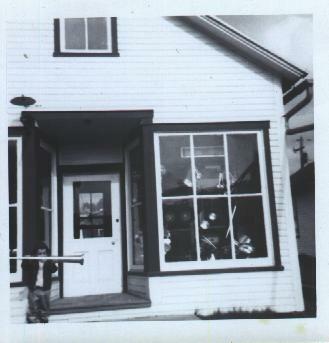 37 businesses supplied the bustling town with everything from groceries to millinery. Liverpool was indeed one of the busiest towns along the canal route. The Pennsylvania Canal system was entwined throughout the Commonwealth. The 'Main Line Canal' was finished in 1829. It began at Duncan's Island (Duncannon) and paralleled the Susquehanna River north through New Buffalo, Girty's Notch, Montgomery's Ferry, Mount Patrick, Liverpool, Selinsgrove and on to Northumberland, a total distance of 39 miles. The canal brought industry to all the communities it served along with a rowdy bunch of characters. The canal builders were, according to documentation, mostly Irish and Chinese. Liverpool served as a hub at the halfway point of the Main Line, hosting an active local business community including hotels, canal boat builders and the ususal businesses found in a self-sustaining town of the era. The Chinese apparently settled a small town a few miles inland from Liverpool, even today known as Oriental. There are no descendants of these Chinese workers remaining today. Railroads forced the canals out of business in the late 1880's. No track was ever laid along the West side of the river, route of the Main Line Canal, so it stayed open to private operators until 1926, after which it was drained. Some parts of the canal are, to this day, not filled in. Evidence of the existence of the canal can still be found along its former route. In 1950, the original canal towpath and parts of the canal were graded and filled in for the construction of the new Rt. 11/15. This road now bypasses the original main road which once wound through the towns it served. Front St., Liverpool, sits about 100 feet behind Rt. 11/15. Local lore abounds with stories about Liverpool during the canal days. Look for these stories here. Map of the Pennsylvania Canal syetem. Peter Walt, Liverpool Canal Boatman, an online article. The Pennsylvania Canal Society maintains the history of the canal system. Offers field trips. More to come ..help needed here. There were scores of gunmakers in Pennsylvania during the Golden Era of the 1800's. Some of the of the finest gunmakers were the Shulers from Liverpool. Shuler guns were stamped with the Shuler name and Liverpool. Their most popular guns were the flintlock and the double barrel swivel [photo] guns. These longrifles were very popular and desireable among gun owners. Collectors can recognize a Shuler from the unique engravings applied by the gunmaker. Early gun owners were proud to own a decorated and engraved gun and each gunmaker had his own style. It is said that only the guns made for Indians were plainer and lacked this engraving. John Shuler Sr. was the first to make the guns. The craft was carried on by his three sons, John Jr., Samuel and Joseph Shuler. After many years the craft was passed down to John Ramsey and Caleb W. Shuler. John Shuler Jr. was noted for making the most numerous guns. Shuler guns were said to be used in Indian wars in California by the Modos Indian tribe. Famous mountain man Jim Bridger was said to own only Shuler rifles for his personal use. Years have passed but the Shuler name in gun making will never die. These guns are highly collectible with some models bringing over $3000.00 today. The old gun shops are still standing in the Boro of Liverpool and used as private residences. The Schuler family were very civic minded and community spirited folks in those days and they contributed many family members to the civil war effort. Shuler family descedants remain in this small town. Total quantity unknown; very linited. One contract for 150 pairs of pistols given to John Shuler in 1808 by the U.S. Gov't. and there are recorded deliveries of 136 pistols by him in 1809. 54 caliber. 9 5/8" round barrel; smoothbore. Pin-fastened full walnut stock; brass mountings; wooden ramrod; reinforced type double neck hammer. Lock marking ahead of hammer; US with date marked vertically at rear or only US marked vertically at rear. Top of barrel marked: SHULER. An extremely rare and highly desirable early American military handgun. A family tradition. Four generations and still going! Thomas Albert (T.A) Stailey worked for Wesley Kauffman's roofing and spouting business on N. Front St. where Matter's Garage was later located (now Matter's Gift Shop). Tin standing seam roofs and spouting were the staples of tinsmiths in those days. T.A. later bought out Kauffman's business and moved to a shop next to his residence at 214 S. Market St. The shop still stands today. Son Dilley took over the business, later joined by his brother Ray, having retired from carpentry. This venture was known as Stailey Bros. Ray also made school house and grandmother clocks. Ray and Dilley never married, but another brother Emory and his wife Ruth had five sons and a daughter. Emory's sons never took up the trade, but upon Dilley and Ray's deaths, Emory's son Edward acquired the family house, shop and tools. Edward's son Edward, Jr. and his son Wayne took up the trade at the same location and continued the business for a few years, making tin items. Then another grandson of Emory's, Kenneth Lee Jr., son of Kenneth Lee, acquired the tools from his uncle Edward and started his own shop just outside of neighboring Millerstown, and is currently in business today working at the tin trade. This [photo] shows Kenneth Lee Jr., as a youngster, standing outside of his great uncle Dilley's tin shop at 214 S. Market St. This [photo] shows the fine tinware, all signed Stailey. 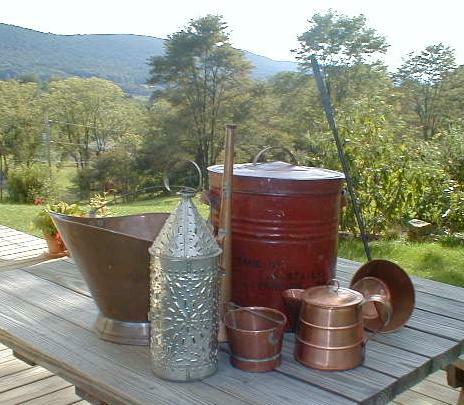 The large red can was made by T.A., The copper dipper, coal bucket, copper horn and tin Revere lantern were all made by Dilley, perhaps the most famous of the Stailey tinmen. 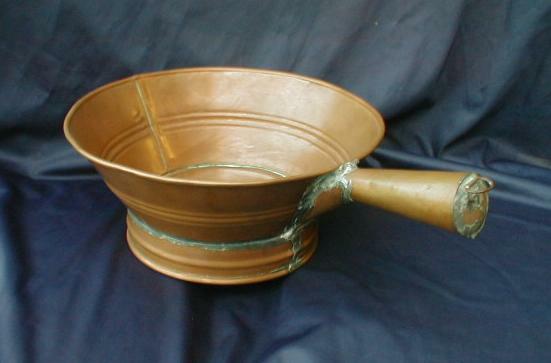 The small copper bucket was made by Stailey Bros. The small coffee pot is by Kenneth Lee Jr., made with his great uncle Dilley's shop tools. 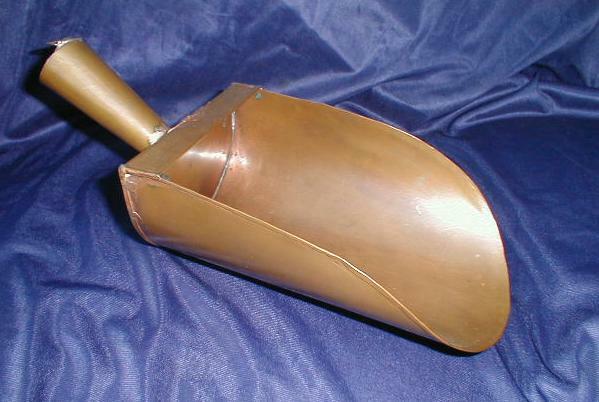 Copper scoop [photo] and copper basin [photo] are more fine examples of the Stailey craftsmanship. June 15, 2001 ..In researching the Perry County boys who served in the Civil War I have come across a web site. This lists the rosteer of the CIVIL WAR, all the regiments, PERRY COUNTY PENNSYLVANIA and other information. June 15, 2001 ..In researching Perry County's connection to the War of 1812 I have come across a web site, copied and loaded onto this server. Girty's Notch, a local landmark, is named for the infamous Simon Girty, the 2nd. Simon's family came from Ireland. Simon Sr. was a trader who traveled along the Indian trails from Harrisburg to Lewistown and further. Simon Jr. was born near Harrisburg, lost his parents at 15, joined the Seneca tribe and led attacks against the settlers. During the Revolutionary War, Simon sided with the British, became a river pirate. When the British lost Detroit in 1796, Simon made his way to Canada. Along the way North he passed through the Notch area. On the run from the Colonists and the Senecas, legend has it, he hid for 3 days in a cave. The exact location of that cave is a matter of conjecture, is still being sought today, since it is believed by local history buffs that Simon hid a huge cache of gold there. Simon reached Canada, lived out the rest of his 77 years among Indian friends. The village of Girty's Notch attracted a wild bunch of unsavory characters in those days. 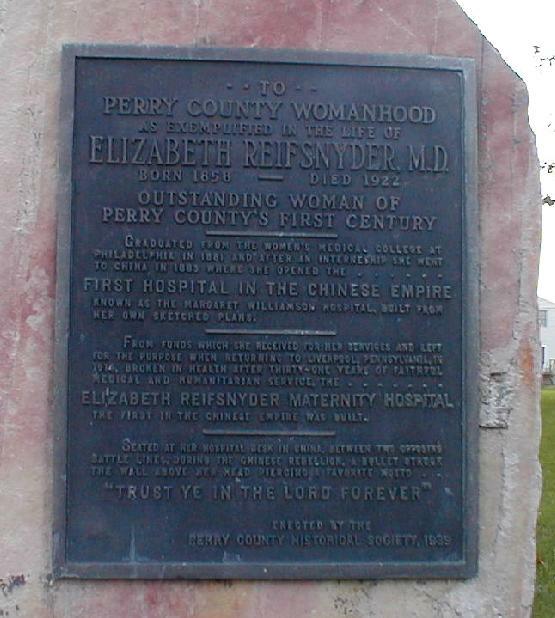 Liverpool native, Dr. Elizabeth Reifsnyder, 1858 to 1922, was the the first woman medical missionary to China and founder if its first hospital [photo]. A plaque in the Liverpool town square [photo] commemorates this Perry County pioneer. Local lore ..Liverpool octogenarian, Ada Derr Snyder, remembers as a young girl, Dr. Reifsnyder brought a young Chinese girl back from China to attend school (finishing school or college). She was in native garb and made quite an impression in the town. She was Ada's playmate for several summers while a guest in the Reifsnyder household. This young woman returned home to someday become Mrs. Chiang Kai-shek, wife of the President of China. She is today in her 90's and residing in Taiwan. 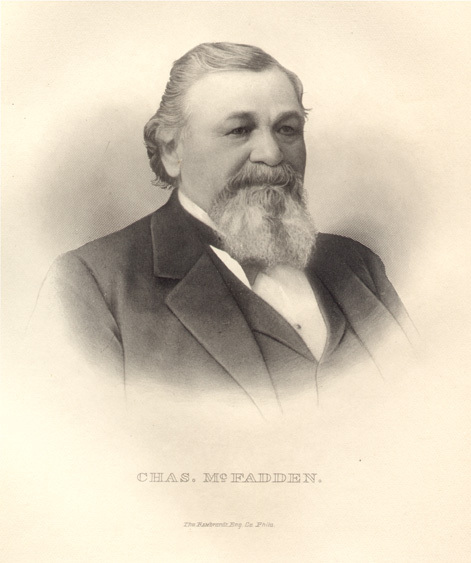 Charles McFadden [photo] was born in Liverpool, Perry County, Pennsylvania, December 13, 1830, and died March 4, 1895, in Philadelphia, where he had attained a most prominent position in the financial and business world. [Click here] to read the story. I want to thank all of those local history buffs who are contributing to this history secton of the web site. Many hours are consumed in this ongoing project. Please check back often to see the new additions. Liverpool will celebrate 200 years in 2008. Thanks to Deb Kiner, correspondent for the Harrisburg Patriot News, for the very nice article on the Liverpool Historians which appeared in the Jan. 16, 2001 issue.